“”Happy New Year” has become a mantra of good cheer and smiles all around but it’s a sentiment that’s strangely disconnected from any deeper reality. Indeed. In a society that has been warped by celebrity culture, and that has swallowed what Benjamin DeMott calls “junk politics”, the only thing the masses can do is watch an oligarch kiss a media-created fantasy like Lady Gaga during a thoroughly-commercialized event in Times Square, while the country plunges head-first into what many are predicting to be a very bleak year. Meanwhile, the 68 Occupy Wall Street protesters who know perfectly well that this country is living in an illusion are brutally arrested and will continue to be villified by many in the media who either choose to ignore what the Occupy movement represents or truly cannot fathom what it means. Schecter’s piece is republished here under Al-Jazeera’s Creative Commons Attribution-Noncommercial-No Derivative Works 3.0 Unported License agreement. New York, NY – Who doesn’t love fireworks, especially on New Year’s Eve, when it’s out with old and in with the new? Who knows how much all these crowd-pleasing explosives cost as they ricochet from loud celebrations all over the globe? And who cares? Many partygoers got too drunk to think about it. Here, in New York, the great ball drop in Times Square has blown up into a major spectacle with celebrities galore that is followed by entertainment specials on every network. 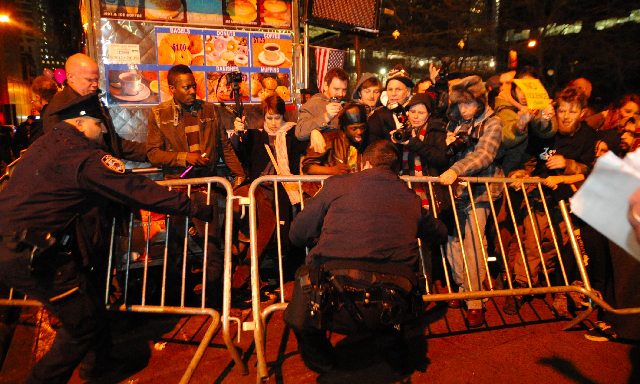 We had Lady Gaga kissing Mayor Michael Bloomberg as the NYPD, a force he recently had the temerity to call his “private army”, pepper sprayed an attempt by Occupy Wall to regain the Park they had been forcibly ousted from a few miles downtown. 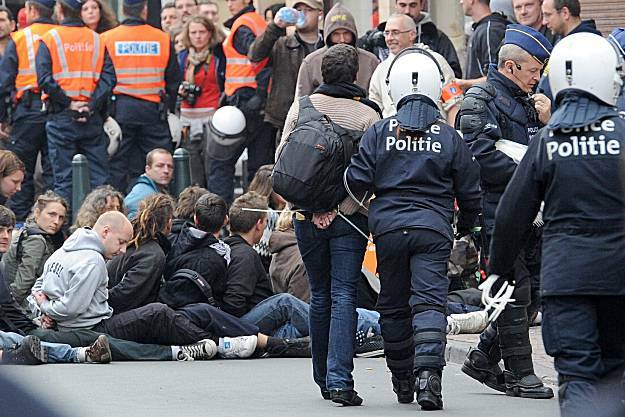 Sixty-eight activists became the first arrestees of 2012. “Happy New Year” has become a mantra of good cheer and smiles all around but it’s a sentiment that’s strangely disconnected from any deeper reality. Would so many millions be cheering if they had any inkling of what lies ahead, as one really bad year foreshadows one that may be even worse? The hunger for happiness and the ability to deny reality is pervasive, and permeates borders everywhere. Somehow there are those who know how truly absurd it is to celebrate when your life is about to turn for the worse. But, even if many did know, would they know what to do? Maybe there is, and we owe it to Fintan O’Toole. That trenchant Irish commentator is a biographer and theatre critic, and a critic also of his country’s crimes and follies, as in his gripping book, Ship of Fools: How Stupidity and Corruption Sank the Celtic Tiger. He reminds us of the famous saying by Donald H Rumsfeld, the former United States secretary of defence, that “There are known knowns… there are known unknowns… there are also unknown unknowns”. But the Irish problem, says O’Toole, was none of the above. It was “unknown knowns”. Given the degraded state of American media, we can’t assume that a TV-addicted audience of young people can know how bad it is or will become. France’s President Sarkozy said the crisis was not finished, while Italy’s president called for more sacrifices. Growth in Europe has stalled as the debt crisis has forced governments to slash spending. The leaders’ New Year messages came as leading economists polled by the BBC said they expected a return to recession in Europe in the first half of 2012. Liberal economists like Paul Krugman at the New York Times have dismissed any talk of recession. He says the right word to use is depression. Politicians who believe that it takes confidence to promote a recovery want to stay positive, even though critics call this confidence-hype a “con game”. The unemployment rate will not drop below 7.00 per cent at any point during the year and will be above 8.00 per cent for at least half of the year. With our educational system in disarray, and technical skills at an all-time low among US workers, the fact of the matter is that all of the good jobs are in China, India, Vietnam, Brazil, Thailand and Argentina. One of the top 10 United States banks will fail or be forced into a takeover by the end of the year. My best guess is Bank of America. BOA will be forced into liquidation under the too big to fail provisions of the Dodd Frank Act. The FHFA as conservator of BOA may impose the Chapter 13 principal reduction programme for all loans and serviced by the Bank. The number of homes in foreclosure will double or triple from 2011 levels and home values will drop by another 15 per cent to 20 per cent by the end of year. I do not expect to see any real recovery in the housing market until at least 2022. Ok, maybe this is all boring stuff that glazes over most minds. It’s certainly not as much fun as reading about Hollywood scandals. These realities will only be more obvious when gas goes to $5 a gallon, when more cities plunge into darkness to save money on electricity, or when more students drop out because they can’t afford the loans or tuition. As the Movie Biz is reporting one of its worst years, food prices are rising although some of this is invisible because of new packaging techniques that permit selling fewer of a product for more. It is no wonder then that politicians don’t want to sound like bad news bears and talk about any of this because they know they can’t do anything. Politicians can’t tell markets what to do. They prefer to demonise Iran perhaps in the hope that a new war will divert public attention and get keep the military-industrial complex generating new jobs. They are always on the prowl for new threats to exploit. President Obama has now written off the possibility of doing anything new while planning to wage war on the Republican Congress as his campaign focus. The Republicans, meanwhile, are still battling each other, determined to prevent the rich from paying a fairer share of taxes. As the New Year comes in with a bang, we are seeing our politics recede with a whimper, with signs of paralysis and stalemate all around. Even Lady Gaga can’t help us now.